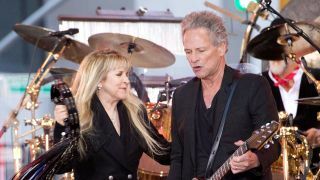 Guitarist Lindsey Buckingham has left Fleetwood Mac. His last show with the band was at Radio City Music Hall in New York in January, when the band played a short set as part of the MusiCares Person of the Year show. He is to be replaced for upcoming shows by former Tom Petty And The Heartbreakers guitarist Mike Campbell, and Crowded House leader Neil Finn. In a statement, Fleetwood Mac say: "We are thrilled to welcome the musical talents of the caliber of Mike Campbell and Neil Finn into the Mac family. With Mike and Neil, we’ll be performing all the hits that the fans love, plus we’ll be surprising our audiences with some tracks from our historic catalogue of songs. Fleetwood Mac has always been a creative evolution. We look forward to honoring that spirit on this upcoming tour." "Fleetwood Mac has always been about an amazing collection of songs that are performed with a unique blend of talents," adds Mick Fleetwood. "We jammed with Mike and Neil and the chemistry really worked and let the band realize that this is the right combination to go forward with in Fleetwood Mac style. We know we have something new, yet it’s got the unmistakable Mac sound." “Two weeks ago I received a wonderful invitation to be a part of a truly great band," says Neil Finn. "A few days later I was standing in a room playing music with Fleetwood Mac. It felt fresh and exciting, so many great songs, a spectacular rhythm section and two of the greatest voices ever. Best of all, we sounded good together. It was a natural fit. I can’t wait to play. Buckingham joined Fleetwood Mac in 1975, going on the perform on the band's most successful albums and writing or co-writing four songs from 1976's classic Rumours, including Go Your Own Way and The Chain. He left in acrimonious circumstances after the recording of 1987's Tango In The Night, but rejoined the band a decade later.